1. Energy efficient: Installing outdoor ceiling fans can help to preserve energy. 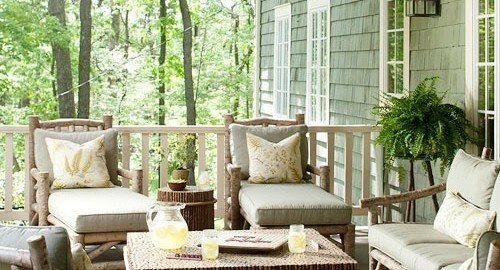 Homeowners are able to sit outside on their patio and/or deck and relax under their fan without being forced to sit in the air conditioned house all of the time. They can also be controlled via remote and placed in various areas around and in the house. This helps keep the light switch from being flipped on and off and gives the homeowner some ease when utilizing the fans. 2. Whimsical appeal: If you are a decorating fanatic, outdoor ceiling fans are a great addition to any blooming exterior décor. They bring in attention and add to the overall appeal of your back or front yard. Take our Minka Aire Bronze Outdoor Fan with its large leaf like blades for instance; this fixture will give any outdoor deck that “wow” factor. Outdoor ceiling fans will keep you cool in the summer and warm in the winter. This can be done by changing the direction of the fan blades to push the air up or down. 3. Low maintenance: Outdoor ceiling fans can be cleaned in a jiff. They may take a little more precision to clean than indoor ceiling fans do, but a good wipe down before the dirt starts to build up will prevent your fan from getting too grimy. Fans are a relatively low maintenance way to keep cool during the summer and turn your outdoor space into a usable outdoor room. Ceiling fans don’t just keep the inside of a home cool. They can definitely be a useful asset to any outdoor area. Here at Premier Lighting, we have a vast selection of outdoor ceiling fans that we think will make a great addition to your outside space. Take a look at our fixtures here and come into our showrooms for a free consultation.